The Kimble Family embarked on a summer’s baseball journey and is traveling across the country visiting 30 baseball parks to support GiGi’s Playhouse and share the Generation G message; Be Kind, Be Accepting, and Be Generous. Thank you, Laura Kimble for sharing your story! Your GiGi’s Family in Phoenix/Scottsdale miss you and wish you a fun and safe journey. I want to share with you about a trip my family is currently taking; we are traveling the US for 3 months, visiting all 30 MLB stadiums, spreading awareness for Down syndrome and raising money for GiGi’s Playhouse. We would love it if you liked our page, shared our message or asked your networks (your company, employers, friends or local teams) to contribute, if you’d like. But that’s not why I’m sharing about our adventure. 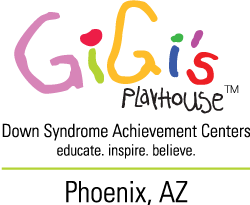 I want you to know about GiGi’s Playhouse. They are a Down Syndrome Achievement Center focused on improving and supporting the lives of individuals with Down Syndrome and their families. They are an international non-profit and they offer free classes, therapies, tutoring and career development help for individuals in the DS community. They are always looking for volunteers. You may live in one of the 37 cities that currently have one or maybe you can get involved if you live in one of the 200 cities where they’re somewhere in the planning stages of opening one. They are changing lives and I hope yours can be impacted by the amazing work they do. I also want to share in case there are any families struggling with an unexpected diagnosis of any sort. When Ted was born and we received his Down syndrome diagnosis, we weren’t sure if these plans, or any of our plans, would work out the way we thought. But we didn’t want his diagnosis to hold him back from any of his dreams and we thought the best way to show him what was possible was to go after our dreams too. He has been an amazing source of inspiration for us and we have already seen him touch the lives of so many others.